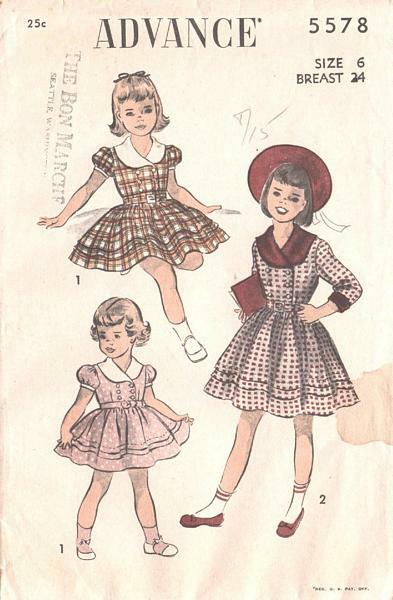 Advance vintage sewing pattern 5578 for girls one piece dress. Double breasted, belted dress in long or short sleeves. Large, one piece, shawl style collar. Full gathered skirt. Self fabric belt. Size 6; Breast 24 Waist 22. Pattern is used and complete. Unprinted pattern pieces, factory precut to size. Envelope has small beverage spot, store stamp and aging but is in solid condition. See additional photo below. Undated late 1940's, early 1950's.